Following the sell-out success of our 50th Anniversary Firewalk, get ready for the return of the coals in February 2019! This adrenaline-fuelled challenge is like no other and will put your courage to the test as you hotfoot it across 20 feet of embers burning up to an incredible 1236°F. Put your best foot forward and get sponsored to change the lives of young people with complex disabilities with every step. With more places available this time, there’s even more opportunity for you to say Can Do to conquering the coals in aid of National Star. Have YOU got what it takes? This once-in-a-lifetime experience begins with a motivational two-hour training session. 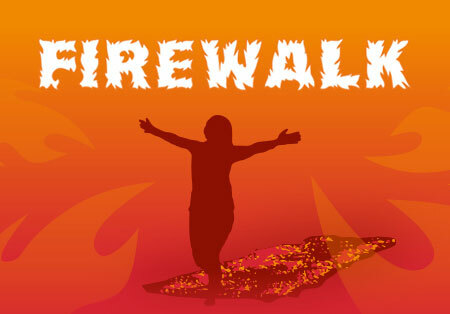 By the end of it you will feel empowered, inspired and ready to take on the firewalk safely. One by one our firewalkers will cross 20 feet of wood embers burning at 1236 degrees Fahrenheit. Family, friends and co-workers are encouraged to cheer for you from the sidelines! Once you have successfully braved the blaze you will receive a certificate of achievement and be given the opportunity to share your amazing experience with your fellow fearless firewalkers. Food and drink will be available to buy on the night. National Star has partnered with firewalking experts BLAZE to run the event. BLAZE has an impeccable safety record and puts in place stringent checks and procedures. All firewalkers are prepared for the challenge, both mentally and physically, in a compulsory two-hour training session. There is a non-refundable registration fee of £20. All of our firewalkers are required to raise a minimum of £80 in sponsorship, although you are encouraged to raise as much as possible. Every single penny you raise will enable us to continue to transform the lives of young people with complex disabilities. Tell people about your fearless fundraising or recruit a team to handle the heat with you. Download and share our flyer to spread the word about the hottest challenge around. Are you ready to conquer the coals for National Star? Register here to secure your place. (If you experience any difficulties registering online, please download and use this form to register). For more information about our Firewalk, please enter your details below and our Fundraising team will get in touch with you very soon. You can also view our event FAQs or watch our Q&A video with Karen Sterling from firewalking experts Blaze below!